Vladimir graduated from Peoples’ Friendship University of Russia in 1978. In 1982, he became Ph.D. 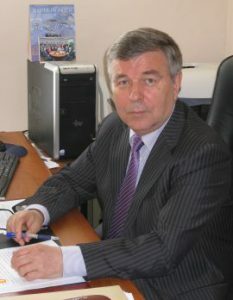 In 1986, he founded the department of mathematical methods of economic analysis (presently department of economic and mathematical modeling), which was a pioneer in informatization educational process and scientific research at the humanities science at Peoples’ Friendship University of Russia. Vladimir led delegations to several universities in the United States, France, Germany and other countries to deliver lectures and research work. In 2003, he defended his Doctor of Economic Sciences thesis and became a full professor. He is Honorary Worker of Higher Professional Education and Chairman in dissertation committe. He was scientific director for “International Economy” program. Vladimir mentored dozens of specialists, bachelors and master’s students, and 14 Ph.D. students. He is a member of the International Academy of Organizational Sciences and the head of undergraduate double-degree program Economics and Management and graduate double-degree International Business in cooperation with the University of Nice, and graduate double-degree program International Project Management in cooperation with CNAM University (Paris). Vladimir is an expert at the Russian Government’s Russian Humanitarian Scientific Fund. He is Vice-president of the International Association of Economists “CEMAFI international”. Vladimir Matyushok was elected to the International Francophone Academic Network CEDIMES, which was founded in 1972 and includes researchers and scientists from 33 countries participate in CEDIMES. He was the President of the international jury for awarding prizes to young scientists at CEDIMES. The award ceremony was held at the Sorbonne. Vladimir is author of more than 160 scientific publications, including textbooks and monographs.